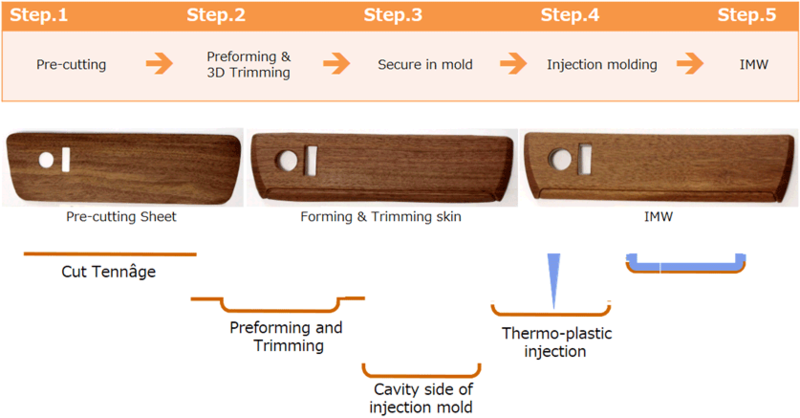 IMW Method (Insert Molding of Wood) is a new method that make it possible to do insert molding of Tennâge® wood sheet combined with different materials. It is compatible with conventional film insert molding, and you can use it to create various insert molding products, regardless of using real wood nor not. IMW (Insert Molding of Wood) is a specially developed real wood veneer that can be used for insert molding with plastics as a part of injection molding process. Conventional film insert molding uses resin films. With our new technology, "IMW Method", you can use not only resin film, but also our real wood sheet, Tennâge®. 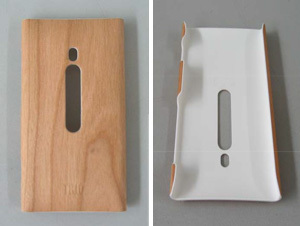 Insert Molding of Wood Method is a special insert molding method that make it possible to inset mold real wood with plastics, co-developed by ZEROOONE PRODUCTS Ltd. In Japan and TRIO in China. There is our unique know how at the stage of process of preforming (vacuum thermoforming, press thermoforming). Also, there is our special know how at the last stage of process of injection molding. Furthermore, there is our special technology and know how in our Tennâge® real wood sheet film, that make it possible to do all these processes. Our IMW Method is a new revolutional method of making it possible to do insert molding of real wood sheet combined with theses many original know how and technology. 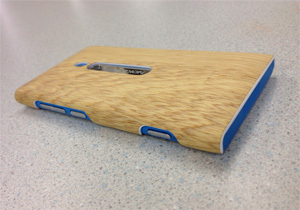 Conventional film insert molding was not able to use real wood sheet. 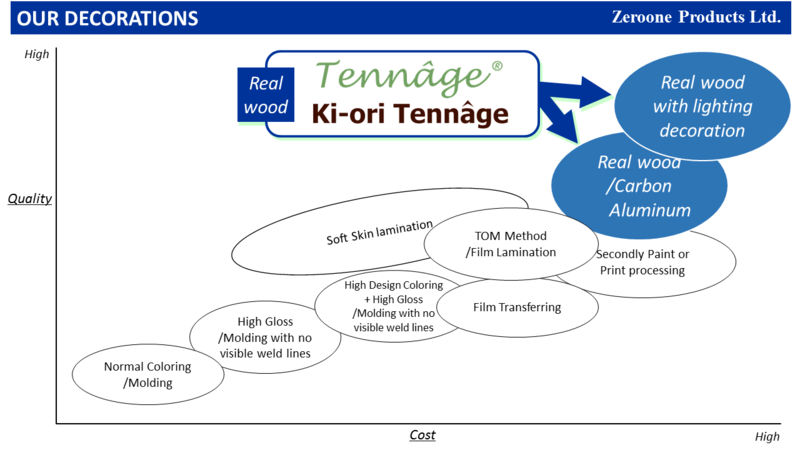 Therefore, we have developed a "Hybrid- Tennâge®, which is a real wood sheet (Tennâge® or Ki-Ori Tennâge® )" attached with a different material (resin, metal, etc.). Using this "Hybrid" to our revolutional "IMW Method", you can create many different kinds of insert molding products with real wood sheet. What's so special about the IMW Method? 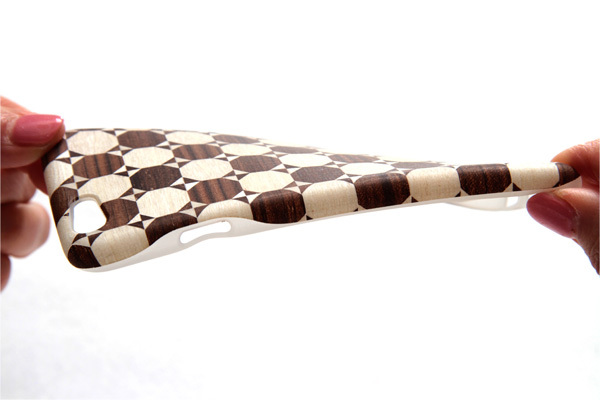 Our special technique made it possible to mold real wood veneer sheet into precise 3D molding. 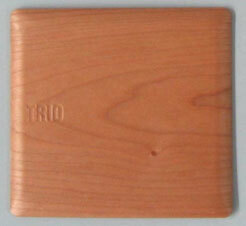 The same mold can be used for real wood veneer insert mold, regular insert mold, and injection mold. Many different decorations are available for grade management. 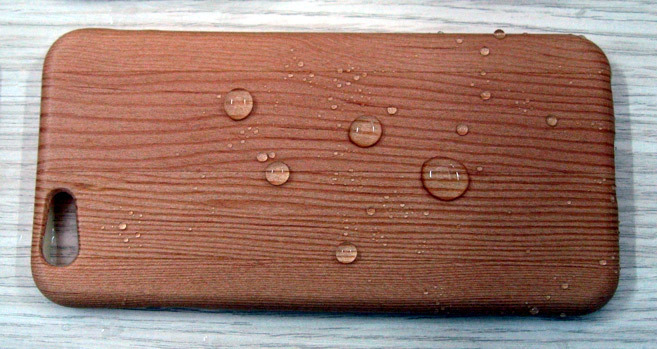 Real wood look and feel can be kept without any topcoat or treatment on the surface. 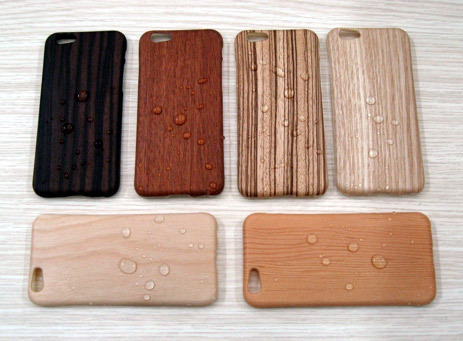 Superb water resistant and stain resistant. ▲Stain Resistant Testing: Wash with water after 24Hrs. Nothing left. Below are the insert molding products and product samples using our IMW Method. Curved design with real wood sheet is the advantage of IMW Method.